Exoclick is banner advertising network. It is best adult advertising network. If you have adult website choose it is primary. It accept non adult website or blogs and pay high rates for pop under ads. I not have any adult website so i use popunder ads . Its ecpm is very good. It give pop under,float and banner ads.It is not accept sub domain or self hosted website. 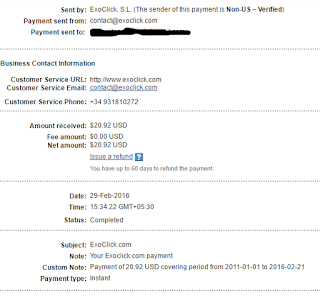 For website approval no need of high traffic.reviews of exoclick reviews with payment proof and earning report. If anyone not getting approval from Adsense try this network it give banner ads and pop under ads.According my experience it provide good rates for publishers.I am using ad networks for provide reviews and give payment proof and earning reports. So new bloggers are get easily information.Many networks are scam. I already write about popads , popcash , adnow these are legit and pay regular. It have 4 th rank in all advertising network since 2006,having 4 billion impression daily.It offers 3 type ads CPC,CPM,and smart CPM. Cpc means they pay per click,cpm means pay per impression,and smart cpm means they choose high cpm banner cost in usa 0.05$ and in india 0.01$ ,cpm is in usa 0.1,popunder and interstitial are cpm based and its cpm is about 2$. Its ustomer is good they reply fast. They clear all questions. Exoclick have good reputation in advertising network. Customer support is not best they reply from emails. They not support live chat. Its signup form is not complicated it is simple signup form. After fill form they ask for complete profile and add website. Website approval is very fast within 1 hour but some time takes 24 hour. It not accept self hosted website and sub domain for example blogger. many time after approve website they are disapprove websites and say not sufficient content. 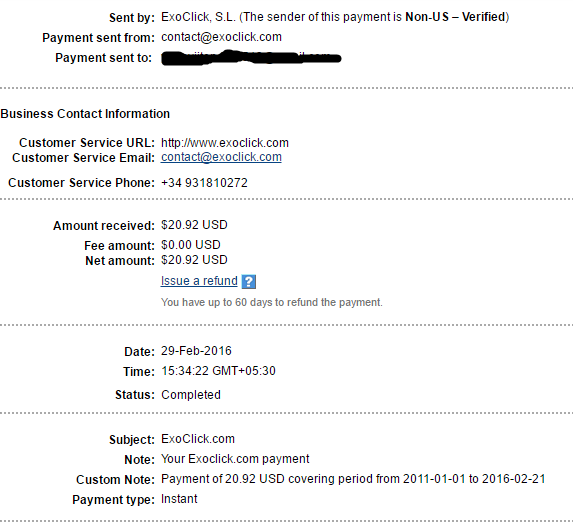 Its payment is easy and low 20$ for paypal this is good fir small publisher they can get easily payment. It accept payoneer,wire transfer. Payment cycle is every Monday NET 7 basis. It provide refer campaign. Referrer get 5 % earning of referral life time. The main problem of receiving first payment publisher need mail to customer support when they reach minimum payout. They review again your blog and clear payment. Many time they not release payment and say you website not have good content or insufficient content. Minimum payout is only 20$ every small and big publisher can get payment easily. Payment frequency is NET-7 basis. High quality ads and clean ads. For Asian countries very low cpm rates. Some time webpage redirect to ad page. Work good only for adult website. your blog is good thanks for provide reviews. Nice article, will apply this in our website. Thanks.